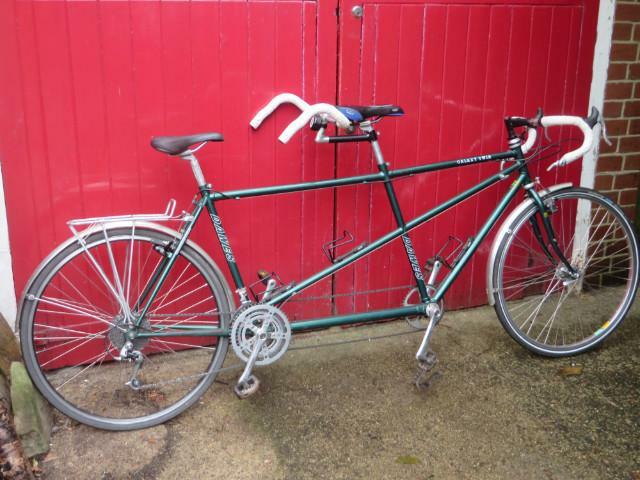 Good, lightweight tandem in good condition; for sale as we have managed to find another (unfortunately heavier) tandem with S&S couplings to make tranportation easier, and we have no space to keep this one as well. 700c wheels, seat tubes ~58 and 54 cm, with plenty of height flexibility for riders of around average height. It has 27 gears and has powerful self- actuating cantilever brakes. There is a choice of pedals (standard or SPD clip-ons) and also upgrade options of MKS quick-release pedals for flatpacking the tandem for storage or transport, and of a rear wheel with an arai drum brake .